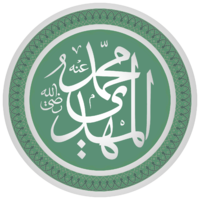 In Shia Islam, the imamah (Arabic: إمامة‎) is the doctrine that the figures known as imams are rightfully the central figures of the ummah; the entire Shi'ite system of doctrine focuses on the imamah. Shi'ites believe that the Imams are the true Caliphs or rightful successors of Muhammad, and further that Imams are possessed of divine knowledge and authority (Ismah) as well as being part of the Ahl al-Bayt, the family of Muhammad. These Imams have the role of providing commentary and interpretation of the Quran as well as guidance. According to Nasir al-Din al-Tusi, the Imam is a means through which humans receive divine grace, because "He brings men closer to obedience (of Allah) and keeps them away from disobedience." As fulfilling the human being is his wish, it is logical that God appoints Imams to subject man to his wishes. So his existence and his deeds display two forms of grace of God toward man. 3.1.1 Why only (specific) members of Muhammad's family? The word "Imām" denotes a person who stands or walks "in front". For Sunni Islam, the word is commonly used to mean a person who leads the course of prayer in the mosque. 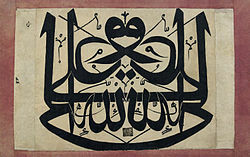 It also means the head of a madhhab ("school of thought"). However, from the Shia point of view this is merely the basic understanding of the word in the Arabic language and, for its proper religious usage, the word "Imam" is applicable only to those members of the house of Muhammad designated as infallible by the preceding Imam. The Shia further believe only these A'immah have the right to be Caliphs, meaning that all other caliphs, whether elected by consensus (Ijma) or not, are usurpers of the Caliphate so those were political positions not divine positions. All Muslims believe that Muhammad had said: "To whomsoever I am Mawla, Ali is his Mawla." This hadith has been narrated in different ways by many different sources in no less than 45 hadith books of both Sunni and Shia collections. This hadith has also been narrated by the collector of hadiths, al-Tirmidhi, 3713; as well as Ibn Maajah, 121; etc. The major point of conflict between the Sunni and the Shia is in the interpretation of the word 'Mawla'. For the Shia the word means 'Master' and has the same elevated significance as when the term had been used to address Muhammad himself during his lifetime. Thus, when Muhammad actually (by speech) and physically (by way of having his closest companions including Abu Bakr, Umar and Uthman [the three future Caliphs who had preceded Ali as Caliph] publicly accept Ali as their Master by taking Ali's hand in both of theirs as token of their allegiance to Ali) transferred this title and manner of addressing Ali as the Mawla for all Muslims at Ghadiri Khum Oasis just a few months before his death, the people that came to look upon Ali as Muhammad's immediate successor even before Muhamamd's death came to be known as the Shia. However, for the Sunnis the word simply means the 'beloved' or the 'revered' and has no other significance at all. Within Shia Islam (Shiism), the various sects came into being because they differed over their Imams' successions, just as the Shia - Sunni separation within Islam itself had come into being from the dispute that had arisen over the succession to Muhammad. Each succession dispute brought forth a different tariqah (literal meaning 'path'; extended meaning 'sect') within Shia Islam. Each Shia tariqah followed its own particular Imam's dynasty, thus resulting in different numbers of Imams for each particular Shia tariqah. When the dynastic line of the separating successor Imam ended with no heir to succeed him, then either he (the last Imam) or his unborn successor was believed to have gone into concealment, that is, The Occultation. The Shia tariqah with a majority of adherents are the Twelvers who are commonly known as the "Shia". After that come the Nizari Ismailis commonly known as the Ismailis; and then come the Mustalian Ismailis commonly known as the "Bohras" with further schisms within their Bohri tariqah. The Druze tariqah initially were part of the Fatimid Ismailis and separated from them (the Fatimid Ismailis) after the death of the Fatimid Imam and Caliph al Hakim Bi Amrillah. The Shia Sevener tariqah no longer exists. Another small tariqah is the Zaidi Shias, also known as the Fivers and who do not believe in The Occultation of their last Imam. Although all these different Shia tariqahs belong to the Shia group (as opposed to the Sunni group) in Islam, there are major doctrinal differences between the main Shia tariqahs. After that there is the complete doctrinal break between all the different Shia tariqahs whose last Imams have gone into Occultation and the Shia Nizari Ismailis who deny the very concept of Occultation. The Shia Nizari Ismailis by definition have to have a present and living Imam until the end of time. Thus if any living Nizari Ismaili Imam fails to leave behind a successor after him then the Nizari Ismailism’s cardinal principle would be broken and it’s very raison d'être would come to an end. Shias believe that Imamah is of the Principles of Faith (Usul al-Din). As the verse 4:165 of Quran expresses the necessity to the appointment of the prophets; so after the demise of the prophet who will play the role of the prophet; till the people have not any plea against Allah. The same logic that necessitated the assignment of prophets also is applied for Imamah. That is Allah must assign someone similar to prophet in his attributes and Ismah as his successor to guide the people without any deviation in religion. They refer to the verse (...This day I have perfected for you your religion and completed My favor upon you and have approved for you Islam as religion...) 5:3 of Quran which was revealed to the prophet when he appointed Ali as his successor at the day of Ghadir Khumm. By the verse Quran, 2:124, Shias believe that Imamah is a divine position always Imamah is accompanied by the word guidance, of course a guidance by God's Command.A kind of guidance which brings humanity to the goal. Regarding 17:71, no age can be without an Imam. So, according to the upper verse 1.Imamah is a position which is appointed by God and must be specified by Him 2.Imam is protected by a divine protection and no one exceles him in nobility 3. No age can be without an Imam and finally Imam knows everything which is needed for human being to get to the truth and goal. Why only (specific) members of Muhammad's family? The doctrine of the Imamate in Isma'ilism differs from that of the Twelvers because the Isma'ilis had living Imams for centuries after the last Twelver Imam went into concealment. They followed Isma'il ibn Jafar, elder brother of Musa al-Kadhim, as the rightful Imam after his father, Ja'far al-Sadiq. The Ismailis believe that whether Imam Ismail did or did not die before Imam Ja'far, he had passed on the mantle of the imamate to his son Muhammad ibn Isma'il as the next imam. According to Isma'ilism, God has sent seven great prophets known as Nātiqs "Speaker" in order to disseminate and improve his dīn of Islam. All of these great prophets has also one assistant known as Sāmad "Silent" Imām. At the end of each seven Sāmad silsilas, one great Nātiq has been sent in order to improve the faith. After Adam and his son Seth, and after six Nātiq–Sāmad silsila (Noah–Shem), (Abraham–Ishmael), (Moses–Aaron), (Jesus–Simeon, son of Jacob), (Muhammad–Ali); the silsila of Nātiqs and Sāmads have been completed with Muhammad ibn Isma'il. Zaidiyyah or Zaidi is a Shia madhhab (sect, school) named after the imam Zayd ibn Ali. Followers of the Zaidi fiqh are called Zaidis (or are occasionally called Fivers in the West). However, there is also a group called the Zaidi Wasītīs who are Twelvers. In the context of the Shi'a Muslim belief in spiritual leadership or Imamate, Zaydis believe that the leader of the Ummah or Muslim community must be Fatimids: descendants of Muhammad through his only surviving daughter Fatimah, whose sons were Hasan ibn ʻAlī and Husayn ibn ʻAlī. These Shi'a called themselves Zaydi so they could differentiate themselves from other Shi'is who refused to take up arms with Zayd ibn Ali. Zaydis believe Zayd ibn Ali was the rightful successor to the Imamate because he led a rebellion against the Umayyad Caliphate, who he believed were tyrannical and corrupt. Muhammad al-Baqir did not engage in political action and the followers of Zayd believed that a true Imām must fight against corrupt rulers. The renowned Muslim jurist Abu Hanifa who is credited for the Hanafi school of Sunni Islam, delivered a fatwā or legal statement in favour of Zayd in his rebellion against the Umayyad ruler. He also urged people in secret to join the uprising and delivered funds to Zayd. Unlike Twelver Shi'ites, Zaydis do not believe in the infallibility of Imāms and do not believe that the Imāmate must pass from father to son—but believe it can be held by any descendant, from either Hasan ibn ʻAlī or Husayn ibn ʻAlī. Ghaybat al-Sughra or Minor Occultation (874–941), consists of the first few decades after the Imam's disappearance when communication with him was maintained through deputies of the Imam. During the Minor Occultation (Ghaybat al-Sughrá), it is believed that al-Mahdi maintained contact with his followers via deputies (Arab. an-nuwāb al-arbaʻa or "the Four Leaders"). They represented him and acted as agents between him and his followers. Whenever the believers faced a problem, they would write their concerns and send them to his deputy. The deputy would ascertain his verdict, endorse it with his seal and signature and return it to the relevant parties. The deputies also collected zakat and khums on his behalf. For the Shia, the idea of consulting a hidden Imam was not something new because the two prior Twelver Imams had, on occasion, met with their followers from behind a curtain. Also, during the oppressive rule of the later Abbasid caliphs, the Shia Imams were heavily persecuted and held prisoners, thus their followers were forced to consult their Imams via messengers or secretly. The fourth deputy died six days later and the Shia Muslims continue to await the reappearance of the Mahdi. In the same year, many notable Shia scholars such as Ali ibn Babawayh Qummi and Muhammad ibn Ya'qub Kulayni, the learned compiler of Kitab al-Kafi, also died. One view is that the Hidden Imam is on earth "among the body of the Shia" but "incognito." "Numerous stories" exist of the Hidden Imam "manifesting himself to prominent members of the ulama." The eighth Imam, Abd Allah al-Akbar of the Ismaili Shia remained hidden but continued the Ismaili movement in the 9th century in Salamiyah, Syria. The eighth to tenth Imams, (Abadullah, Ahmed and Husain), remained hidden and worked for the movement against the period's time's rulers. First phase of seclusion ends with 10th Imam. The 11th Imam Abdullah al-Mahdi Billah, under the guise of being a merchant, and his son had made their way to Sijilmasa, fleeing persecution by the Abbasids. Imam Abdullah founded Fatimid Caliphate. The Fatimid Ismaili Imams continued till 20th Imam holding the post of caliph also, ruling a vast part of Arabian peninsula. Upon the death of the twentieth Imam, al-Amir bi-Ahkami'l-Lah (d. AH 526 (1131/1132)), his two-year-old child at-Tayyib Abu'l-Qasim (b. AH 524 (1129/1130)) was appointed twenty-first Imam. The supporters of Tayyeb became the Tayyibi Ismāʿīlī. As Tayyeb was not in position to run the dawah, Queen Arwa al-Sulayhi, the Da'i al-Mutlaq, acted as his regent. Imam Tayyeb was hidden, and the second phase of seclusion started. The Da'i had now been given absolute authority and made independent from political activity. With the period of time the Tayyibi divided further into several sects headed by different Dais. These Da'i al-Mutlaq continued acting on behalf of the hidden Tayyibi Ismāʿīlī Imams till date. Dawoodi Bohra is the biggest sub-sect amongst the Tayyibi Ismāʿīlī with a population spread over many countries. The name of Imam as it appears in Masjid Nabawi. According to Twelvers, there is always an Imam of the era, who is the divinely appointed authority on all matters of faith and law in the Muslim community. Ali was the first of the Twelve Imams, and, in the Twelvers and Sufis' view, the rightful successor to Muhammad, followed by male descendants of Muhammad through his daughter Fatimah. Each Imam was the son of the previous Imam, with the exception of Husayn ibn Ali, who was the brother of Hasan ibn Ali. The twelfth and final Imam is Muhammad al-Mahdi, who is believed by the Twelvers to be currently alive, and hidden in the Major Occultation until he returns to bring justice to the world. It is believed by Twelver and Alevi Muslims that the Twelve Imams have been foretold in the Hadith of the Twelve Successors. All of the Imams met unnatural deaths, with the exception of the last Imam, who according to Twelver and Alevi belief, is living in occultation. The Ismaili line of imams for both sects (the Nizari and Musta'li) continues undivided until al-Mustansir Billah (d. 1094). After his death the line of the imamat separates into the Nizari and Musta'li dynasties. The line of imams of the Musta'li Muslims (also known as the Bohras/Dawoodi Bohra) continued up to Aamir ibn Mustali. After his death, they believe their 21st Imam, at-Tayyib Abu'l-Qasim went into a Dawr-e Satr (period of concealment) that continues to this day. In the absence of an imam they are led by a Da'i al-Mutlaq (absolute missionary) who manages the affairs of the Imam-in-Concealment until re-emergence of the Imam from concealment. The line of imams of the Nizari Ismaili Shia Muslims (also known as the Agha-khani Ismailis in South and Central Asia) continues to their present living 49th hereditary imam, Aga Khan IV (son of Prince Aly Khan). They are the only Shia Muslim community today led by a present and living (Hazir wa Mawjud) imam. The Zaidi branch of Shi'ism established its own line of Imams starting in the year 897; the line continued without interruption until 1962 when the North Yemen Civil War brought the Imamate to an end and established a republic. The Syrian mufti Ibn Taymiyyah (d. 728 AH/1328 AD) composed a long refutation of the notion of the Imamate in his Minhaj as-Sunnah an-Nabawiyyah. Ja'far al-Sadiq Yemen-Fivers Zaydi-Alavids Muhammad "al-Imām"
^ The Sufi spiritual leader Ibn Arabi said:A Muslim is a person who has dedicated his worship exclusively to God...Islam means making one's religion and faith God's alone. ^ Amir-Moezzi, Mohammad Ali. "SHIʿITE DOCTRINE". Encyclopædia Iranica. Retrieved 24 April 2016. ^ Nasr, Seyyed Hossein; Dabashi, Hamid; Nasr, Seyyed Vali Reza (1988). Shi'ism: Doctrines, Thought, and Spirituality. SUNY Press. ISBN 978-0-88706-689-4. ^ Moslem bin Hajjaj (2006). Sahih Moslem. Dar Tayibbah. p. 882. ^ "Zaidiyyah". The Free Dictionary. ^ "ISMAʿILISM xvii. THE IMAMATE IN ISMAʿILISM". ^ Yeomans 2006, p. 43. ^ Gleave, Robert. "Imamate". Encyclopaedia of Islam and the Muslim world; vol.1. MacMillan. ISBN 0-02-865604-0. ^ "Aga Khan Development Network". ^ See "Ibn Taymiyya’s Critique of Shia Imamology. Translation of Three Sections of his "Minhāj al-Sunna", by Yahya Michot, The Muslim World, 104/1-2 (2014), pp. 109-149. Corbin, Henry (1993). History of Islamic Philosophy, translated by Liadain Sherrard and Philip Sherrard. Kegan Paul International in association with Islamic Publications for The Institute of Ismaili Studies. ISBN 0-7103-0416-1. Tabatabaei, Sayyid Mohammad Hosayn (1979). Shi'ite Islam. translated by Seyyed Hossein Nasr. SUNY Press. ISBN 0-87395-272-3. Motahhari, Morteza (1980). Master and Mastership. Islamic Seminary Publications. ASIN B0006E4J0C. Madelung, Wilferd (2003). "Hasan ibn Ali". Encyclopædia Iranica. Madelung, Wilferd (1985c). "ʿALĪ AL-REŻĀ". Encyclopaedia Iranica. Retrieved 2007-11-09. Kohlberg, E.; Poonawala, I. K. (1985). "ʿALI B. ABI ṬĀLEB". Encyclopaedia Iranica. Retrieved 2014-07-07. Amir-Moezzi, Mohammad Ali (2005). "SHIʿITE DOCTRINE". Encyclopaedia Iranica. Retrieved 2014-07-07. Madelung, Wilferd (1988). "AL-BAQER, ABU JAFAR MOHAMMAD". Encyclopædia Iranica. Retrieved 2007-11-08. Amir-Moezzi, Mohammad Ali (2007). "ISLAM IN IRAN vii. THE CONCEPT OF MAHDI IN TWELVER SHIʿISM". Encyclopædia Iranica. Madelung, Wilferd (1985a). "'ALĪ AL-HĀDĪ". Encyclopædia Iranica. Madelung, Wilferd (1985b). "ʿALĪ AL-REŻĀ". Encyclopædia Iranica. Madelung, Wilferd (2004). "ḤOSAYN B. ʿALI i. LIFE AND SIGNIFICANCE IN SHIʿISM". Encyclopædia Iranica. Halm, H (1987). "ʿASKARĪ". Encyclopaedia Iranica. Nasr, Seyyed Hossein (2007). "Ali". Encyclopædia Britannica Online. Tabataba'i, Muhammad Husayn (2008). Islamic Teachings in Brief. Qum: Ansariyan. Nasr, Seyyed Vali Reza (2006). The Shia revival : how conflicts within Islam will shape the future (1st ed.). New York: Norton. ISBN 0-393-06211-2. Corbin, Henry (1993) [originally published in French in 1964]. History of Islamic Philosophy, Translated by Liadain Sherrard, Philip Sherrard. London; Kegan Paul International in association with Islamic Publications for The Institute of Ismaili Studies. ISBN 0-7103-0416-1. Tabatabae, Sayyid Mohammad Hosayn (1979). Shi'ite Islam. translated by Seyyed Hossein Nasr. SUNY press. ISBN 0-87395-272-3. Ayoub, Mahmoud (1984). The Qur'an and Its Interpreters , Volume 1. SUNY Press. ISBN 978-0-87395-727-4.
al-Tijani al-Samawi, Muhammad. To Be With The Truthful. Madelung, Wilferd; Daftary, Farhad; Meri, Josef W. (2003). Culture and Memory in Medieval Islam: Essays in Honor of Wilferd Madelung. I.B.Tauris. ISBN 978-1-86064-859-5. Tabatabaei, Sayyid Mohammad Hosayn (1975). Shi'ite Islam. Translated by Sayyid Hossein Nasr. State University of New York Press. ISBN 0-87395-390-8. Mashita (2002). Theology, ethics and metaphysics. Hiroyuki. London: RoutledgeCurzon. ISBN 9780700716708. Chittick, William C. (1980). A Shi'ite Anthology. SUNY Press. ISBN 978-0-87395-510-2. Dungersi, Mohammed Raza. A Brief Biography of Imam Hasan bin Ali (a.s.): al-Askari. Bilal Muslim Mission of Tanzania. GGKEY:NT86H2HXN40. Nasr, Seyyed Hossein (2013). Islamic Spirituality: Foundations. Routledge. ISBN 978-1-134-53895-9. Al-Tabataba'i, Muhammad H. (1977). Shi'ite Islam. SUNY Press. ISBN 978-0-87395-390-0. Qurashi, Baqir Shareef (2005). The Life of Imam Muhammad Al-Jawad. Qom: Ansariyan Publications. Amir-Moezzi, Mohammad Ali (27 September 1994). The Divine Guide in Early Shi'ism: The Sources of Esotericism in Islam. SUNY Press. ISBN 978-0-7914-2122-2. Amir-Moezzi, Mohammad Ali (15 February 2011). The Spirituality of Shi'i Islam: Belief and Practices. I.B.Tauris. ISBN 978-1-84511-738-2. Qurashi, Baqir Sharif (1999). The Life of Imam Muhammad ibn 'Ali al-Baqir. Ansariyan Publications. ISBN 9644380444. Qurashi, Baqir Sharif (2007). The life of Imām Zayn al ‘Abidin (A.S.). Ansariyan Publications. ISBN 978-9644381652. Rizvi, Sayyid Saeed Akhtar (1988). Imamate: The vicegerency of the Holy Prophet. Bilal Muslim Mission of Tanzania. ISBN 978-9976-956-13-9.
al-Shaykh al-Saduq (2006). UYUN AKHBAR AL-REZA The Source of Traditions on Imam Reza (a.s.) Vol.2. Qom: Ansariyan Publications. p. 194. Rizvi, Sa'id Akhtar (1956). Imamate: The Vicegerency of the Prophet. This page was last edited on 29 March 2019, at 10:01 (UTC).